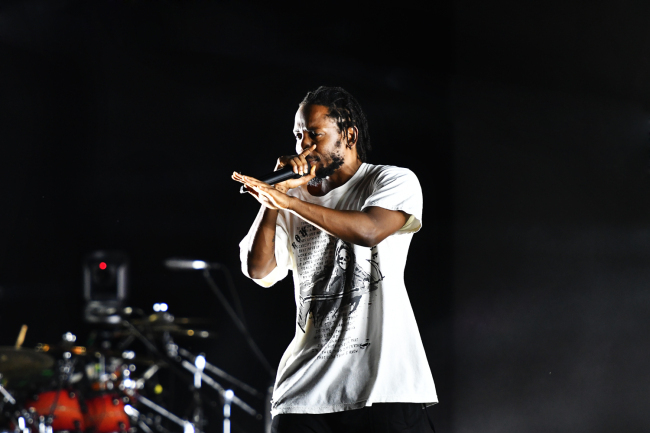 The first concert in Korea for hip-hop royalty Kendrick Lamar was long overdue, but he showed his mastery in Seoul, despite a short set with a few hiccups. Performing before the sell-out crowd for the Hyundai Card Super Concert on Monday at Jamsil Sports Complex, Lamar proved his reputation through and through, as he orchestrated the 20,000 crowd. Opening the action was “DNA,” a wildly-popular song that you hear it in virtually every hip-hop club in Korea. The crowd put their hands up and raved on, succumbing to the pumping adrenaline. The crowd chanting along to the words of “Lust,” “Pride,” was a testament to how big Lamar is in Korea. They were relentless despite the merciless heat that has been scorching the peninsula. As much as the winner of 12 Grammy awards is known for his groove, flow and rhymes, Lamar is also a storyteller who touches on social issues. 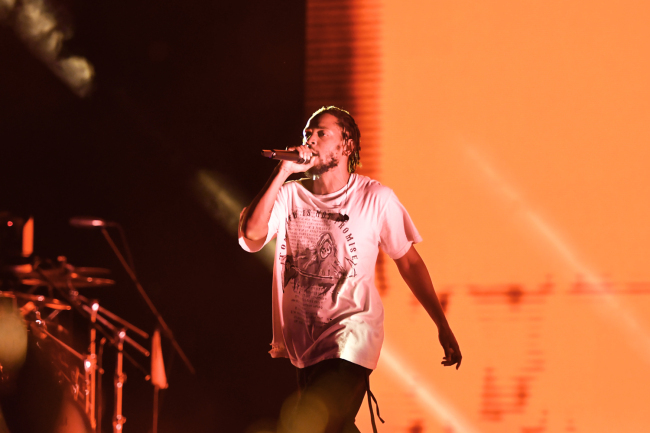 In 2018, his album “Damn” became the first nonclassical, nonjazz album to win the Pulitzer Prize for Music. 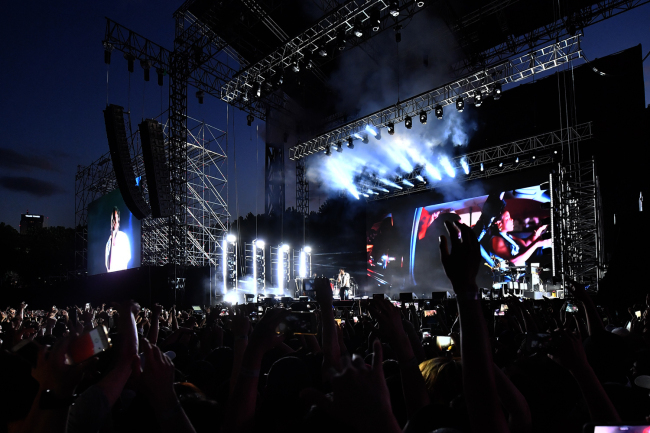 Monday night’s entertainment in southern Seoul was packed as “Buzzin,” “King Kunta,” “Big Shot,” “Goosebumps,” “Collard Greens,” “Backseat Freestyle” were only some of the songs performed by the living legend. Despite the party fever, there were some hiccups along the way, including a shortage of staff in some areas. The audience members were sorted according to sections and were to wait in line to enter the arena. At one point, the line broke and people started flooding to the entrances with no staff members present to maintain order. The biggest issue were the technical difficulties that struck twice during the songs. The first occurred in the middle of “Swimming Pools” when vocals were suddenly cut off. 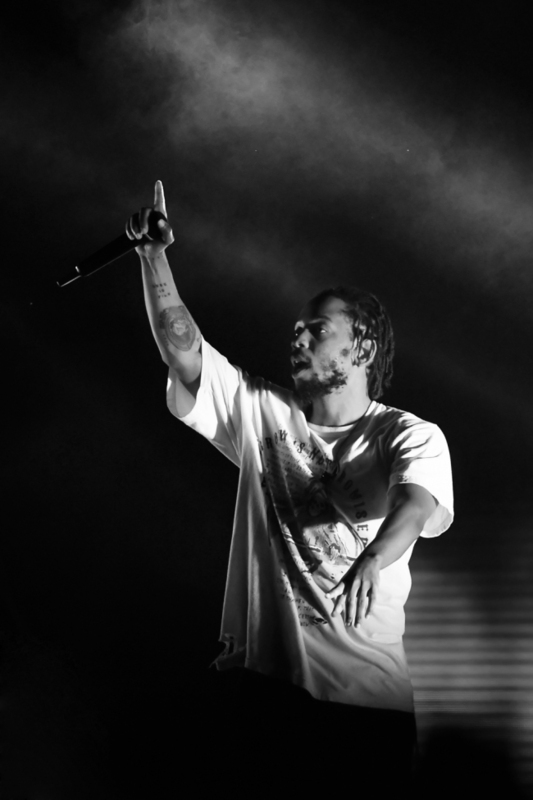 Lamar remained calm and kept rapping the words until the sound came back on. But some of the crowd lost patience when it happened again during “Loyalty,” at which point the party was in full gear. Boos were heard from some, and Lamar had to work to fire up the crowd again. It was a pleasant experience for Korean fans who longed to see Lamar up front, but many complained about the length of the show, which was not much longer than the opening performance by SiR. The outdoor concert also suffered from the record heat, and making the crowd wait under the scorching sun ahead of the concert was not a good idea. Super Concert is an event held since 2007 that features top musicians. Past performers include Coldplay, Eminem, Lady Gaga and legends like Paul McCartney, Stevie Wonder and Metallica.